It is extremely important that a patient feels comfortable with an oral health professional so they regularly attend their checkups. The right dentist can help a patient work toward a healthier, more beautiful smile. Dentists like Dr. Sam Shin, DDS help their patients get the oral care they need to maintain healthy teeth and gums. 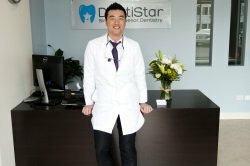 After graduating from New York University’s College of Dentistry in 2004, Dr. Shin started to work toward becoming the best dentist he could be. He holds contributing memberships to the American Dental Implants Association, the American Academy of Implant Dentistry, the American Academy of Pediatric Dentistry, the American Dental Association, and the Illinois State Dental Society. Dr. Shin works closely with his patients to ensure that they get the care that they need for their specific oral issues. If you are looking for a dentist in Glenview who is looking out for you, Dr. Shin is it. Schedule an appointment for a checkup and see how Dr. Shin can help you improve your smile.